VCT publications can be ordered through good bookshops, or may be purchased from the our shop at Ingrow. Visa and other cards accepted for postal sales: contact 01535 680425 or email admin@vintagecarriagestrust.org for further information. 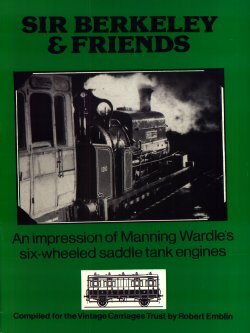 "Sir Berkeley and Friends: An impresssion of Manning Wardle's six-wheel saddle tank engines"
With 21 illustrations this 18 page booklet describes much of the working life of the locomotive Sir Berkeley and its subsequent restoration and preservation. Tables give specifications of other Manning Wardle products and list other preserved engines from the same stable.